Easyglaze’s innovative bay and bow windows offer a number of features and benefits unrivalled in today’s market place and are available in a range of styles. The ultra-slim frames increase the flow of natural light as well as creating an enhanced field of view. 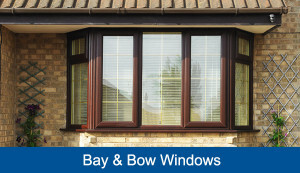 Enrich the look of your bow and bay windows with a range of additional designs including leaded glass, Georgian or astragal bars, or even decorative sash horns. If you’re looking to create a bow window from a current flat window this can easily be achieved using our insulated GRP canopy roofs. These are available in various colours, sizes and finishes depending on your specific installation requirements. We stock various bay couplers and poles which feature a contemporary trim detailing to preserve period charm whilst adding an attractive, yet subtle, modern twist which perfectly matches with our range of window and door profiles. These feature cleverly designed interior and exterior joint couplings that prevent dust traps forming, making cleaning with just a damp cloth a quick and easy procedure. Where an installation is required to support a certain weight we can also provide special poles and post’s that use a jacking point that fits through the PVCu cill and sits onto the brickwork to carry the load.